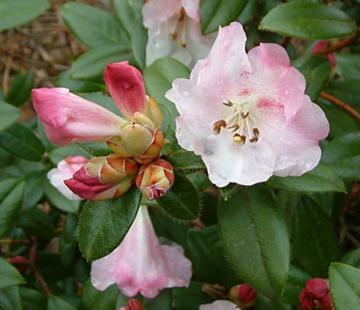 Compact, rounded, evergreen shrub with small, bristle-margined, green leaves and freely produced, loose trusses of pale pink flowers opening from darker buds in March. Flowers are susceptible to damage from early frosts. Bodnant hybrid of R. ciliatum x R. moupinense.